There’s a Partial Solar Eclipse (New Moon) on January 6th at 15 degrees Capricorn which is conjunct Pluto on one side and conjunct Saturn on the other. That’s a heavyweight combination which is associated with a need for grit and perseverance, often bringing hardship or deprivation. Pluto is also in orb of a square to Uranus which is the disruptive influence that has been around globally since 2012. The Eclipse chart looks divisive with such a prominent Uranus, hastening radical change, perhaps with hints of potential chaos. But the 2 South Saros Series in which it appears, is concerned with group energy, and the wish to join into unusual groups. Previous eclipses in this series occurred in 2000, 1982, 1964, 1946, 1928 and 1910. The Total Lunar Eclipse (Full Moon) of 21 January at zero degrees Leo, if anything, highlights Uranus even more since it squares onto the eclipsed Full Moon. Uranus can be a torchbearer, shining light into the unknown, walking a new path, the rebel or revolutionary, enlightened or a disruptor. This Lunar Eclipse has an aggravated and ruthless Mars square Saturn Pluto in Capricorn, so there will be challenging events around the day or in the days/weeks thereafter. There’s also a financial-bubble-bursting Neptune square Jupiter Venus; and an opportunistic, adventurous Mars trine Jupiter Venus. EFFECTS ON THE SUN SIGNS (read also your Ascendant/Rising sign) – the effects can come just before and for several months after. Eclipses are challenges to change one area of your life and develop hidden potential. Usually it involves reaching out for unfamiliar experiences and refusing to take the path of least resistance. ARIES: The Solar Eclipse hints at a need to push harder at work to gain respect and recognition. Making your mark will be important to you so you won’t leave any stones unturned. The Lunar Eclipse will prompt you to widen your circle of friends and make definite plans for the longer term, while keeping in mind the need to enjoy yourself with loved ones as well. TAURUS: Lifting your sights higher and broadening your horizons or spreading your views to a wider circle of people are all the message of the Solar Eclipse. This isn’t the time to be sunk in detail and concerned with trivia. Think big, speak confidently. The Lunar Eclipse will make it clear that you need to find a better balance between your head and your heart, putting ambitions on equal footing with home and emotional matters. GEMINI: The Solar Eclipse falls in your hidden, deeply confidential chart area which rules joint finances, intimate relationships and matters of fundamental importance. Changing the way you share, care, relate and co-operate isn’t easy but will bring fulfilment if you can manage to change the habits of a lifetime. The Lunar Eclipse will rev up your engine and your thinking, sending you off in several directions. It’ll be important to ground enthusiastic plans in common sense and do some preparation and practical planning. CANCER: The Solar Eclipse will focus your mind on all the close partnerships in your life, at home and at work, with a sense that changes are overdue and that new agreements or adjustments must be made. You’ll need to be less self-sufficient, more adaptable for the good bonds to stay strong. Flaky connections may become more obvious. The Lunar Eclipse will stir up issues around money, both personal finances and where you hold joint responsibility. Finding a way to be independent while still co-operative will be your challenge. LEO: Too much work and too many practical chores will require that you put fitness, stamina and health up as a priority – that’s the message of the Solar Eclipse in Capricorn. Learning where your limits are and when to say no to excessive demands will help you stay on an even keel. The Lunar Eclipse in your own sign will have you see-sawing backwards and forwards, wondering how to preserve your independence while still keeping partners happy. VIRGO: The Solar Eclipse will challenge you to waken up your social life and relationships with loved ones with an eye to getting more attention and affection. Giving more, means you’ll get more. The Lunar Eclipse is hidden in the sign before yours so will also need quiet reflection to get the inspiration you need. If you take the right approach it will heal your body and your mind. LIBRA: The Solar Eclipse in Capricorn falling at the base of your chart will prompt you to consider your roots, your home and domestic set up and decide what changes need to be made to bring you more security and fulfilment ahead. The Lunar Eclipse will find you dancing between friends on the one hand and loved ones on the other, wondering who is the more important. Both is the answer. SCORPIO: The pressure of events in your everyday schedule will require that you manage your time well in coming months, get better organised and communicate clearly. The Capricorn Eclipse will keep you running and be fairly challenged. The Lunar Eclipse says you need to find a better balance between your head and your heart, between ambitions and your emotional life. SAGITTARIUS: The Capricorn Solar Eclipse says financial security is all important in coming months which means not throwing money around to impress. You’ll be best to take the initiative and get plans rolling to improve your cash situation ahead. The Lunar Eclipse will fire up your enthusiasm but plans will need to be thought through and double checked carefully otherwise you’ll leap before you look. CAPRICORN: A Solar Eclipse in your own sign hints that you are at a crossroads and need to make major decisions about your path ahead. What you can’t do is amble along as before. You’ll be more independent-minded for a few months since you know you need to make your own choices. The Lunar Eclipse will find you trying to balance your own personal interests with those of a partner in both financial and emotional matters. AQUARIUS: The Solar Eclipse falling in the sign before yours will pull you into an inward-looking, more reflective phase for a few months. You’ll need to dig deep to find the answers you need to bring you more fulfilment ahead. The Lunar Eclipse will focus on close relationships and how you balance your own needs with those of partner’s. PISCES: The Solar Eclipse in Capricorn for you is all about friends and future plans. Widening your circle of acquaintances, though not easy, will bring benefits. You’ll also need to push yourself to be practical about what lies ahead. The Lunar Eclipse will find you working too hard, perhaps putting yourself out too much for others, with the hint that you need quiet time to re-centre and recharge your batteries. Eclipses normally come in twos, a Solar and two weeks before or after a Lunar. This time we’re blessed or cursed with having two Solar Eclipses (New Moons) – on July 13th at 21 degrees Cancer and August 11th at 19 degrees Leo; and a Lunar Eclipse (Full Moon) on July 27th at 5 degrees Aquarius. Both the Solar Eclipses fall in Saros series which according to Bernadette Brady (The Eagle and the Lark) focus on friendships and relationships. The first in July bringing a glum mood about separations or endings but fast action will produce results; and the second in August bringing a potential collapse of plans or lifestyles with a long-term result of transformation and rebuilding. 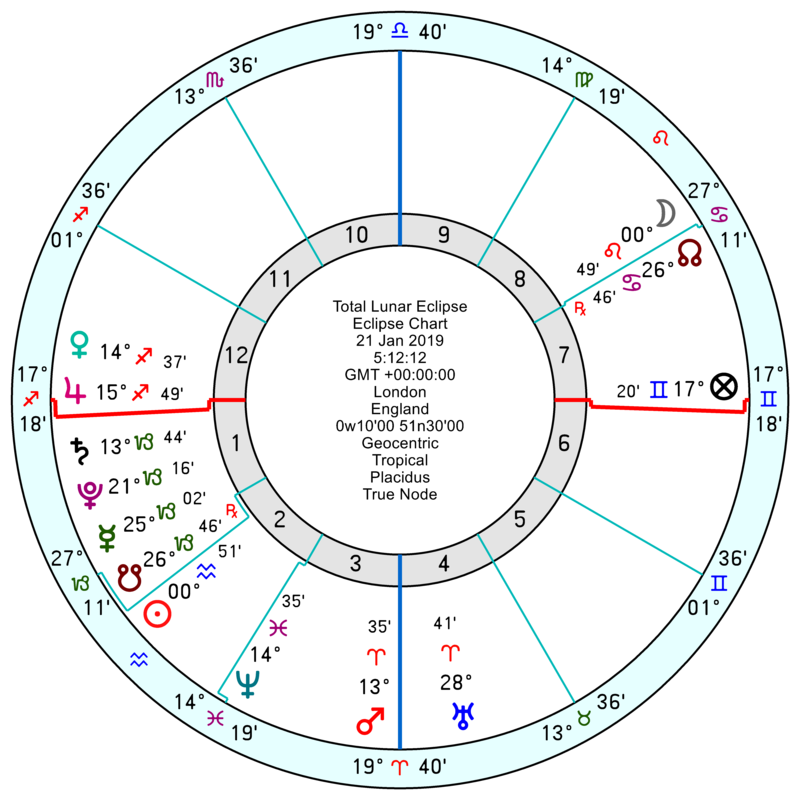 The July 13th Cancer Solar Eclipse is challenging and blocked as the New Moon opposes Pluto; with a disruptive Mars opposition Node square Uranus. But there’s also a workmanlike Earth Grand Trine of Uranus to Saturn and Venus which may bring some stability and common sense. The 27th July Lunar Eclipse has the Moon conjunct Mars opposition Sun, North Node square Uranus, so is likely to be explosive with sudden shocks and surprises. The August 11th Leo Solar Eclipse has the Leo New Moon square Jupiter and inconjunct Pluto with the overly-excitable and uncompromising Uranus Mars Node T square still in place. The Solar Eclipses were around in these Saros series in: 2000, 1982, 1964, 1946 and 1928. The Eclipse effect often strikes up in advance and lingers for a few months thereafter. It challenges you to make adjustments in one area of your life, to shake off old patterns and be bolder moving ahead. Effects on the sun signs as well as your Ascendant sign. Read both. ARIES: Home, romance and friendships are your key focus to see where you can make changes to give yourself more domestic stability and contentment; and to breathe new life into your social and romantic liaisons. Not forgetting to include friends. Ask loved ones for what you need and be prepared to listen to their point of view as well. TAURUS: Managing your time better, streamlining your efficiency and communicating clearly will prevent problems in your everyday life. Which may give you a chance to focus on what you can do to give yourself a stronger sense of roots at home and in your emotional life. Finding a better balance between outer ambitions and inner happiness will be your challenge. GEMINI: Get your finances in shape, take the initiative to improve your long-term security and don’t chuck money around to impress. That’s the Cancer Eclipse. Otherwise get your thinking cap on and sort out a strategy for streamlining your everyday routines without drowning yourself in details and trivia. CANCER: You’re at a crossroads and need to make key decisions about your path ahead. Standing still and sticking to the old ways won’t work. Then your next step will be to reboot your personal finances with an eye to making your situation more stable in the time ahead. Which will mean consulting close partners and altering some of the ways you share, care, relate and co-operate. LEO: The Cancer Eclipse is hidden in the sign before yours so you’ll need quality time to reflect, get the past into perspective and think more deeply about personal dilemmas. Then you’ll be ready to get a grip of your life and put much-needed changes in place. The decisions you make now will dictate what comes next so you’ll have to ponder your options carefully. VIRGO: Look ahead past tomorrow and next week and start planning longer term. You can’t stand still or play away the day. Widening your circle of friends will be part and parcel of what needs to happen. Nothing will happen overnight, so you’ll need time to look inwards and sort out what your real priorities are. LIBRA: Getting your talents out on display is a must. This isn’t the time to be a shrinking violet. Be bold and make your mark. Finding new friends and making team alliances will help in the months ahead as you plan your path for the future. SCORPIO: Injecting more adventure into your life, thinking big and dusting down your grander plans will be your challenges. You need to broaden your horizons. Then you’ll be pushing hard to get recognition for your talents and achievements. It won’t happen if you hide in a corner. Demand more attention. SAGITTARIUS: Negotiating better agreements with those close over money or your emotional life won’t be easy since you’ll need to compromise, be less self-sufficient and pull yourself away from old patterns of behaviour. But it will pay off. Then you’ll fly higher and put exciting plans into gear. CAPRICORN: Sorting out relationship tangles is a must which means being more flexible and accommodating, less rigidly self-sufficient. See both points of view and you’ll fare better. As you dig deeper into your motivations and psychology, you’ll understand what is holding you back from intimacy and from sharing when it comes to cash. AQUARIUS: Work is piling up in front of you which means you’ll need to be efficient, better organised and put as much attention towards staying fit as you do towards the chores. There will also be relationship issues to be addressed. Always an independent sign, you’ll need to be more adaptable and prepared to compromise to get the satisfaction you desire from your closest attachments. PISCES: Love, affection and romance. Not getting enough of them? You need to give in order to get. Hand out kisses, cuddles, hugs and compliments and they’ll come winging back to you. Hard work won’t be in short supply either which means you can’t proceed on a wing and a prayer. You’ll need to be practical, sensible and stick to a schedule. And keep an eye on your keep fit regimes. Staying fit and healthy will be vital. The two Solar Eclipses in 2017 occur on February 26 at 8 degrees Pisces; and 21 August at 29 degrees Leo. Both have an effect for a few months afterwards. And for events out in the world they can also have a longer delay effect (see Astrology of Today’s News post June 17 2017). The Pisces Eclipse was in the 19 South Saros series, (Bernadette Brady: The Eagle and the Lark) which brings pleasant surprises, events which can positively change lives. It occurred before in this series in 1999, 1981, 1963, 1945 – so worth looking back to see the effects on individual charts. The August late Leo Eclipse is Saros Series 1 North which puts pressure on personal relationships. Hasty decisions are cautioned against, since information coming in is distorted and possibly false. Tiredness and health issues are also associated. It also occurred before in 1999, 1981, 1963, 1945. The August Leo Eclipse is visible across the central swathe of the United States; and this series does appear to coincide with significant events in the USA. The US dropped the Hiroshima atomic bomb, four weeks after the 1945 eclipse. In 1963, next time round for 1 North, Martin Luther King was delivering his rousing civil rights speech in Washington to 200,000 African-Americans campaigning for Black civil rights, four weeks after. Three months later President John F. Kennedy was shot in Dallas. The same cycle repeating in 1981 saw US forces shooting down two Libyan planes, and the US air traffic control strike. Then in July 1999, JFK’s son John was killed in a plane crash three weeks before a 1 North solar eclipse. And NATO forces were at war for the first time since 1945, trying to reverse the Serbian ethnic cleansing and genocide of Albanians. In previous 1 North eclipses: Charles Lindbergh made the first solo, non-stop transatlantic flight, from New York to Paris in 33 hours, in 1927; and in 1909 a major earthquake destroyed Acapulco, two weeks after the eclipse. There are also two Lunar Eclipses in 2017: February 11th at 22 Leo, and August 7th at 15 Aquarius. Lunar Eclipses are powerful Full Moons which demand a better balance in the life arenas ruled by the two opposing houses in which they fall in a chart. It’s better with a birth time, but in the absence of that the Sun sign houses are below. Eclipses set major personal themes for your next six months depending on your Sun and Ascendant sign. Eclipses demand you live one area of your life in a new way. This takes effort and courage but it does offer an opportunity. If you get a grip and put much needed changes in place then you can avoid crises in the months ahead. If you know your birth time then look to see which house the Eclipse falls in and it is that arena of your life which needs a shake up. ARIES: The February Pisces Eclipse hinted at the need to take it easier, to find a chance to reflect on the past and get events into perspective. With that phase over, the August Leo Eclipse says it’s time to play, to step out boldly onto the social scene and demand more attention. If you’re not getting enough love, then you need to give more. The Lunar Eclipses both say ‘don’t forget friends’ and keep an eye on the future. TAURUS: The February Pisces Eclipse focussed your mind on friends and future plans. The August Eclipse says home is where your heart needs to be. Forget outer ambitions for a while, and build yourself more security, emotional and physical. Though there’s a hint from the Lunar Eclipses, that you need a balance between head and heart, between your outside and personal life. GEMINI: The February Pisces Eclipse at your midheaven indicated the time to push for recognition had come. Getting your talents out on display and making your mark is important. Then from August you’ll be into a team time, surrounding yourself with friends and being encouraged to look ahead boldly. The Lunar Eclipses both hint at a need to spread yourself equally amongst loved ones and acquaintances. CANCER: The February Pisces Eclipse hinted at a need to raise your sights higher, broaden your horizons and travel or even study more. The August Leo Eclipse will turn your mind to your personal finances. Being pro-active is vital, not spending to impress or throwing money around. Make a plan about aimed at improving your situation over coming years. The two Lunar Eclipses hint you need to keep partners in the loop. You can’t be totally independent. You need to co-operate as well. LEO: The February Pisces Eclipse fell in your hidden chart house, so deeply personal and financial matters were under your scrutiny. Changing the way you share, care, relate and co-operate is important. The Leo August Eclipse suggests you are at a crossroads and need to take significant decisions about your path ahead. It’s your life and should be your choices. You will be more independent for a few months until you know exactly what you want. The two Lunar Eclipses, however, indicate you can’t be an island unto yourself, so putting energy towards relationships will help. VIRGO: The February Pisces Eclipse in your opposite sign says you need to be less self-sufficient and more adaptable to gain fulfilment in relationships. If there are crises emotional around then it’s a hint you need to change your approach. The August Leo Eclipse is more inward looking, a time to delve into your past and get a clearer view of what went on and sort out private dilemmas. The two Lunar Eclipses point to health, both mental and physical being interlinked. LIBRA: The February Pisces Eclipse fell in your chart area of health and work, so both required you taking the initiative. You need to be fit and healthy and streamline your efficiency to get through piles of chores. The August Leo Eclipse will find you looking ahead, making longer term plans, expanding your circle of acquaintances and being more team-minded. The two Lunar Eclipses add another dimension of not forgetting to enjoy life, party when you can, and include friends in your life. SCORPIO: The February Pisces Eclipse in your chart area of romance, children and entertainment will make you aware of any lacks in your life. You’ll need more spotlight, more attention and more love. What goes around comes around, so give more and you’ll get more. The August Leo Eclipse at your midheaven says you must step out boldly at work, push your ambitions ahead and demand more recognition for your achievements and talents. The two Lunar Eclipses says forging a balance between happiness at home and self-worth in your career or outside activities is vital. SAGITTARIUS: The February Pisces Eclipse will narrow your focus down to home, family and domestic matters for a few months. Building yourself secure emotional foundations is vital. The August Leo Eclipse says now you can fly higher, think big and aim for the stars. You’ll push to bring more adventure and stimulation into your life and to broaden your interests and activities however you can. The two Lunar Eclipses says don’t forget the details of everyday life while you dreaming up grand plans. CAPRICORN: The February Pisces Eclipse will keep you running with an exceptionally busy everyday schedule, so you’ll need to manage your time well, streamline your efficiency and communicate clearly. The August Leo Eclipse will prompt you to change the habits of a lifetime and share, care, relate and co-operate in a more engaged way if you are to gain emotional and financial fulfilment. The two Lunar Eclipses say finding a balance between independence and interdependence is vital. AQUARIUS: The February Pisces Eclipse in your chart area of personal finances says you need to get a grip on spending and take the initiative about making your cash situation better organised and more vibrant for the time ahead. The August Leo eclipse says close relationships will be under your scrutiny, with a sense that you need to make adjustments to be more adaptable and co-operative moving ahead if you want satisfaction. The two Lunar Eclipses says balancing your own personal needs with those of close partner’s is vital. PISCES: The February Pisces Eclipse did pose significant choices for you about what path you want to choose for the years ahead. Being slightly more self-sufficient and independent will mean you rely more on yourself to make the decisions that suit you. The August Leo Solar Eclipse in your chart area of work and health, will prompt you to be more focussed on the practical areas of life – staying fit in your body, and being better organised since additional tasks will mean a busy time ahead. The two Lunar Eclipses hint at a need for quiet time for reflection as well as pushing yourself to be more efficient with everyday chores. What is of interest astrologically is that the path of the August 1999 total solar eclipse in the 1 North Saros cycle series (see below) which rose in the Eastern seaboard of the USA, then crossed the UK, curving down across Afghanistan, Pakistan to finish in southern India. It may seem too far back to connect this eclipse to events in 2001 OR 2002. Except there were major aspects to that 1999 Leo eclipse from Saturn in Taurus, Mars in Scorpio, Uranus & Neptune in Aquarius. At the time there was little outward sign of the kind of events such a powerhouse of influences might have suggested. But in January 2001 the same aspects recurred with Mars returning for the first time since 1999 to Scorpio, and along with the Aquarian Sun picking up the tale end of the waning, disruptive Saturn Uranus square. At precisely the time those aspects repeated the devastating Gujarat earthquake in central western India on January 26 2001 - exactly on the 1999 eclipse path - occurred as these aspects all came together again. The catastrophic national foot & mouth epidemic in the UK, also started around this time. 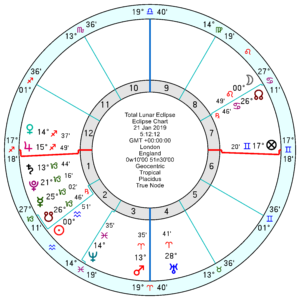 Both UK and India have very fixed charts with major planetary configurations in Taurus, Leo, Scorpio or Aquarius, which were especially triggered off by the eclipse and these transitting planets in fixed signs. 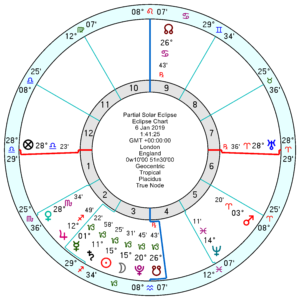 Even later still in late March 2002, when Mars again in a fixed sign - Taurus - running into the square to Uranus, coincided with a major earthquake in Afghanistan, also on that 1999 eclipse path. The USA has a highly cardinal chart, mainly Cancer and Capricorn, so may have escaped the worst effects, tthough the first major economic recession for years is clearly beginning to bite there, and anxieties in the Far Eastern markets especially about Japan have been a contributing factor. Although Japan was not on the path of the 1999 eclipse, it clearly resonates to the 1 North Saros cycle eclipses, since a previous one fell in 1945, weeks away from the dropping of the Hiroshima bomb. In early 2001 the admission that Japan's economy was at the point of collapse was finally made. Obviously the September 11 2001 plane attacks on the USA eastern seaboard could also be marked down on this destructive eclipse path. This all provides more questions that answers at the present moment but is worth watching for the future that eclipse effects can be delayed, especially where the eclipse path is concerned, in certain cases for some years. The eclipse path joining the UK to Germany & Europe fell in June 1936 and war did not break out for another three years. Eclipses of the Sun and Moon occur regularly every six months. The solar and lunar eclipse always fall two weeks apart, on the New Moon and the Full Moon. Some eclipses are partial, and thus less powerful from an astrological viewpoint but even total solar eclipses happen almost every year. Lunar eclipses, when visible, can be easily seen by half the earth's population, but solar eclipses can only be seen on the path of the eclipse trajectory, which varies every time. The total solar eclipse of August 11th 1999 was seen (cloud cover permitting) from places on a narrow band from the US Eastern seaboard, through Cornwall, north France, down through Europe, Belgrade, Iran, Iraq, Turkey, Pakistan, India. The last time a total eclipse was seen was in Britain was in 1927, when novelist Virginia Woolf recorded in her diary "...it was an astonishing moment... We had seen the world dead". At the simple level of sun sign astrology eclipses focus the attention of each of the 12 star signs (from Aries to Pisces) on a different area of their lives where they need to pick up the ball and run with it. Where the focus falls personally for you will depend on which sign the eclipse falls. (See table below). A passive wait-and-see approach, burying your head in the sand, usually does not work. You either volunteer to make radical changes, or they are involuntarily forced on you. Some change is inevitable but you do have a choice about how you handle it. We do know there is evidence in nature of a tangible response to eclipse atmosphere in nature. Monkeys get nervous and waken up during eclipses, even when hidden by clouds. Mistletoe sap rises significantly. My own impression from working in a mental hospital, is that psychological disturbances become heightened, since the intake in the acute admission wards always went up in the days around eclipses. So human behaviour responds both personally and collectively, alongside nature to the little understood physical changes which occur in our universe during eclipses. The theme set by the eclipses is felt most powerfully in the month preceding and following the eclipse date, but usually sets a tone for the six months ahead until the next eclipse. The eclipses also highlight areas in the personal birth chart. If you know your planetary positions, and find your ascendant sign, then read the meaning for that as well as your birthday (Sun) star sign. For the astro-buffs, the eclipses also aspect planets on the personal chart. To take a tragic example, in the personal birth charts of both John F. Kennedy Jnr, and his sister Caroline, there is an Aquarian Moon opposing Uranus in Leo. This was exactly on last year's August eclipse axis, which started its trajectory on the Eastern seaboard where JFK Jnr was tragically killed only a few days before. Emotional upsets of a dramatically sudden nature were to be expected. Although astrologers do not see eclipses as necessarily disaster-ridden they do appear to coincide with significant outer events, sometimes with uncanny precision. The Chernobyl disaster, when the Russian nuclear power station melted down sending out a nuclear fallout greater than 1000 Hiroshima bombs, occurred on the day of a lunar eclipse on 24th April 1986. The Titanic sank on April 15 1912 only two days before a Solar eclipse with the loss of 1500 lives. Nelson Mandela was sentenced to life imprisonment (1964) and made President of South Africa (1994) on the exact day of solar eclipses; and was released from prison two days after a lunar eclipse (1992). The 1 North eclipse last August which warned of health problems, and cautioned against hasty decisions was previously around 18 years before in 1981. Two days before the solar eclipse in July 1981, Prince Charles and Princess Diana were married, which is perhaps a case in point. Eeriely this 1 North eclipse, which over shadowed the recent tragic death of John F. Kennedy, was the one in place when his premature baby brother, Patrick Kennedy, died in 1963 on August 9, two weeks after the solar eclipse of July 20th, and only four months before the assassination of J.F.K. in November. Rolling back to 1945 to another 1 North eclipse influence, American forces dropped the world's first atomic bomb on Hiroshima, killing 130,000 people, four weeks after the solar eclipse. The Solar Eclipse falling July 1st 2000 is in the Saros series which was previously operating on the day Nelson Mandela was imprisoned in 1964, 2 Old North, also occurred on the day of the birth of the Queen's grandson and second in succession to the throne, Prince William. This cycle hints at separations, and major challenges, though with a long term hopeful outcome. Mandela's release from prison in 1992 was two days after the same 10 North lunar eclipse as oversaw his birth in 1918. 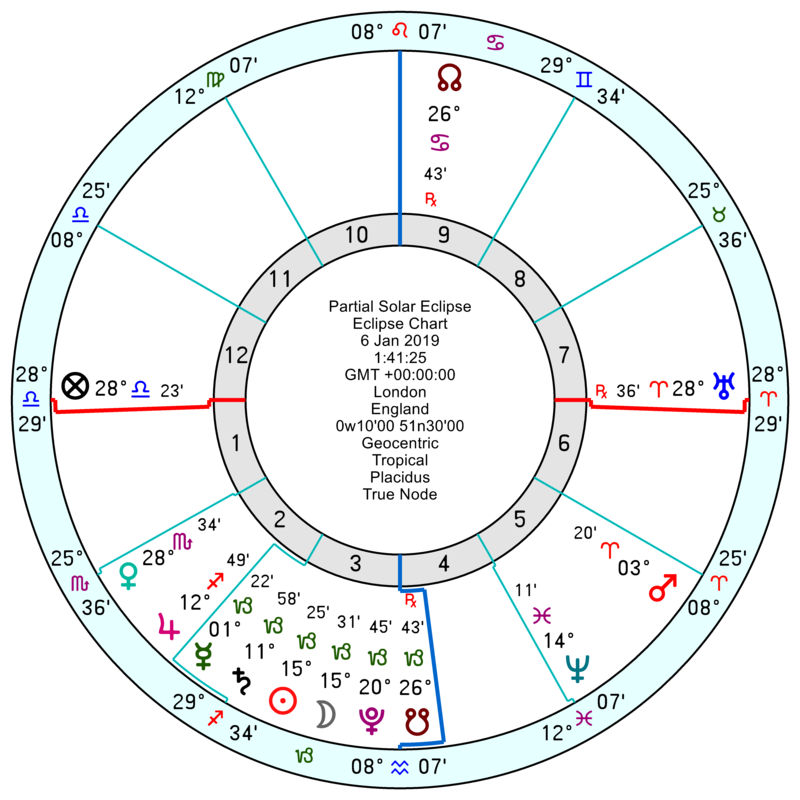 When he became President in 1994, it was on the day of the 14 South solar eclipse in Taurus generally though to bring breakthroughs, and success after a long period of hard work. Certain countries appear to resonate more strongly to specific Saros cycle eclipses. The 18 North solar eclipse fell only a day after the death of Princess Diana in a Paris car crash in 1997. Rolling back 18 years 11 days to the previous 18 North solar eclipse, Earl Mounbatten, the Queen's uncle, was killed along with three others by an IRA bomb, only five days after the total solar eclipse. The Fastnet Yacht Race disaster also occurred in the same month, with 17 yachstmen drowned. Back one to 1961, this eclipse was fell five weeks after Princess Diana's birth, and within two days of the Brandeburg Gate being closed and the building of the Berlin Wall began. In 1944, close to the 1 North lunar eclipse, the heaviest German bombing raids on London since 1941 were taking place, with the Royal Family still in residence. Back to 1926, the 18 North cycle oversaw the births of the two most powerful women in 20th Century British history. In 1926 the lunar eclipse was closest to the present Queen's own birth; and in the previous year the 18 North solar eclipse was the cycle in place within weeks of Margaret Thatcher's birth. Back again to 1908 and the King and Crown Prince of Portugal were assassinated within two weeks of the 18 North lunar eclipse. Other powerful British figures died or saw their effective careers end under the influence of 11 North eclipses. Queen Victoria died in 1901, and two cycles later, her grandson Edward V11 abdicated the throne in 1937 for love of Wallis Simpson. One cycle later in 1955, the great British statesman and war Prime Minister Winston Churchill resigned through ill health. Two 18 year 11 day cycles later in 1991, Mrs Thatcher, Britain's first woman, and longest serving Prime Minister of the century, was forced to resign. These events did not occur on the day itself but within the weeks surrounding the eclipses, but it is still astonishing that they happened in these specific sequence years. The surprise Japanese attack on Pearl Harbour on 7th December 1941, which destroyed 8 battleships and 300 aircraft, and brought the US into World War 11, followed ten weeks after the 16 North solar eclipse. This eclipse had peaked in its trajectory across the heavens exactly above Pearl Harbour. On the following 16 North eclipse phase in 1959, the Cuban Government expropriated US owned sugar mills and plantations. One 18+ year cycle later, the 'King' Elvis Presley died 8 weeks away from the 16 North solar eclipse. Roll on another 18+ years to the autumn of 1995, and America still a country in shock from the Oaklahoma bombing earlier that year, was obsessed by the O.J. Simpson trial which brought in a 'not guilty' verdict three weeks before the 16 North Solar eclipse. The best example of eclipse-coinciding events, where the eclipses are heavily aspected by outer planets is the Gulf War. Saddam Hussein gathered his troops on the Kuwait border in July 1990 three days before the solar eclipse in Cancer on July 22nd 1990, opposed by the awesome triple conjunction of Saturn, Uranus and Neptune in Capricorn. The lunar eclipse two weeks later on August 6th, in Leo, aspected by a threatening Mars Pluto opposition saw the UN impose sanctions, and US troops moving in. The next solar eclipse on January 15th 1991 in Capricorn was aspected again by the massively powerful triple conjunction, and one day later Operation Desert Storm launched against the Iraqis.